Is Your Mouth Full of Life or Full of Death? There are times when someone else says something you’ve been feeling and even trying to express much better, more elegantly than you’ve been able to utter. Today in my inbox I received this post from Desiring God and that was the case. In recent weeks and months I’ve been telling several friends and even people who I don’t know well, the power that lies in the tongue. Or trying to. Much of what I was trying to express, Jon Bloom says much better than I was able to. So check out this post and let God refine you into the life-giving-ridiculous-faith-filled-radically-in-love-with-Jesus-disciple He’s called you to be! A lot is at stake in what we say today. “Death and life are in the power of the tongue” (Proverbs 18:21). In literate societies, tongues include hands that write, type, paint, or sign. People die because of something said. Tongues can be weapons of mass destruction, launching holocausts and wars. Tongues can also be the death of marriages, families, friendships, churches, careers, hopes, understanding, reputations, missionary efforts, and governments. But people also live because of something said. The tongue can be “a tree of life” (Proverbs 15:4). Tongues reconcile peoples and make peace. “Blessed are the peacemakers” (Matthew 5:9). Tongues can make marriages sweet, families strong, and churches healthy. Tongues can give hope to the despairing, advance understanding, and spread the gospel. So what will come out of your mouth today, death or life? “Sword thrusts” or “healing” (Proverbs 12:18)? It will all depend on what’s filling your heart. Jesus said, “. . . out of the abundance of the heart [the] mouth speaks” (Luke 6:45). A critical heart produces a critical tongue. A self-righteous heart produces a judgmental tongue. A bitter heart produces and acerbic tongue. An ungrateful heart produces a grumbling tongue. But a loving heart produces a gracious tongue. A faithful heart produces a truthful tongue. A peaceful heart produces a reconciling tongue. A trusting heart produces an encouraging tongue. So fill your heart with grace by soaking in your Bible. Soak in Matthew 5, or Romans 12, or 1 Corinthians 13, or Philippians 2. And be very careful taking in the words of death in the newspaper, on the radio, the TV, or the blog. The world is full of words of death. “The whole world lies in the power of the evil one” (1 John 5:19) who “was a murderer from the beginning. . . and the father of lies” (John 8:44). Let us not join him in his “restless evil” (James 3:8). For “we are from God” (1 John 15:19), and we believe in his Son, Jesus, “the Word” (John 1:1), “the truth and the life” (John 14:6), and who alone has “the words of eternal life” (John 6:68). Let us join him in speaking these. Today, make your mouth “a fountain of life” (Proverbs 10:11). Be “slow to speak” in general (James 1:19). Encourage more than you critique. Seek opportunities to speak kind, tenderhearted words (Ephesians 4:32). Say something affectionate to a loved one at an unexpected time. Seek to only speak words that are “good for building up,” that “grace to those who hear” (Ephesians 4:29). Be a person whose mouth is full of life. “And now I commend you to God and to the word of his grace, which is able to build you up” (Acts 20:32). I’m a fan of Mark Driscoll. Because he’s a fan of Jesus, the Bible and absolute truth! 🙂 Anyway, Mark Driscoll is halfway through sermon series on Luke. This is no ordinary sermon series…he’s taking almost 3 years (106 weeks in all) and he’s over a year and a half in. This coming Sunday he’ll be preaching, providentially I might add, on Luke 16: 19-31. For those of you who aren’t familiar, I’m including that passage at the bottom of this post. You should check that out and read that passage. Why is this significant to me? Roughly 2 years ago Mark probably approached his elder board to run the idea of a 3 year sermon series 106 weeks in length on the book of Luke by them. When he did that and they agreed to it, I’m fairly confident that he could not have known that Rob Bell would even be writing a book dealing with the topic of hell let alone what week it would be released and the controversy that would be swirling around it . Which is why the fact that he just happens to be dealing with this particular passage the week after the books release is so like God. It’s like Him to just work things out that way. Check out this preview of the sermon. 1. What is hell? What is it like? 2. Is it possible that people can deny God for their whole earthly lives, and have a second chance after death? 3. Why would God make people who are permanently his enemies? Why does God create certain people when he knows that their only future is to be tortured for all eternity? 4. Is hell temporary? Or are the souls of the damned destroyed? 5. Will everyone who doesn’t know Jesus go to hell? What if you’ve never heard of Jesus at all? This sermon is an invitation, and it’s up to us to decide how we will each respond. And Jesus has made it abundantly clear what is at stake. Who Is This Wretched Man Living In A Non Continual Victory Over Sin? I am a wretched man. And earlier tonight I felt like a divided or conflicted man. It’s a feeling I’ve felt before after realizing my sin, but tonight was like no other. I knew I needed to write about it here and share what I believe God showed me. I know that I’m saved by Grace and not by my filthy works. I know also that Jesus came to earth in human form and “became sin”, without sinning so that I could be “credited” with His righteousness, without my doing anything righteous. And in and through all that, I am comforted, challenged and encouraged by Romans 7:14-25 when I listen to Paul describe what I believe to be one of the great challenges of genuine followers of Christ. And that is…how are we to respond to failures to triumph over the sin in our lives? One of the reasons I made Live2Worship.net was to showcase the glory of God. The tagline says it best…”it’s why we’re here”. But another reason in the beginning was to share with the world, both believers and non-believers, what God is doing through, to and for me. Tonight’s post is an outpouring of something I can’t contain. My prayer is that it helps my readers deal with, think about and fight against the ongoing, ever-present sin in their lives. In my continual battle to crush sin in my life, like all Christians I win some and lose some battles, realizing that Christ won the war by dying on the cross and raising from the dead. But sometimes when I blow it, I’m shaken to my core, as I was tonight. I began thinking about Paul’s words as I prayed asking God to forgive me and telling Him how broken I was about my condition and actions. As I read the verses, a few things struck me that were significant, but one thing stood out. And that is that this is clearly a man who LOVES God and dearly, deeply loves the LAW of God. Non-believers can’t do that. And the thing that became crystal clear to me is that there is a genuine, proper response that Christians should have to their sin. And this passage is the model for that response. Let me share 2 quotes from 2 Godly men that summarize this passage. Paul is not telling us that the life of the “wretched man” is as bad as it could be, only that it is not as good as it should be, and that because the man delights in the law and longs to keep it perfectly his continued inability to do so troubles him acutely. . . . The “wretched man” is Paul himself, spontaneously voicing his distress at not being a better Christian than he is, and all we know of Paul personally fits in with this supposition. · Oh the wretchedness I feel in these times! I long for deliverance from this body that constantly threatens to kill me, and that I have to mortify day after day. Verse 24: “Wretched man that I am! Who will set me free from the body of this death?” (see Romans 6:6; 8:10, 13). Nobody should want to live this way. Or settle to live this way. That’s not the point. The point is, when you do live this way, this is the Christian response. No lying. No hypocrisy. No posing. No vaunted perfectionism. Lord, deliver us from a church like that – with its pasted smiles, and chipper superficiality, and blindness to our own failures, and consequent quickness to judge others. God give us the honesty and candor and humility of the apostle Paul. This is encouragement for the person who loves God and His laws. The Christian experience is not perfect, but it is real. The enemy wants to lie to us and convince us when we fall that we’re cast out and useless to God or that He doesn’t love us anymore or that there’s a limit to His grace, mercy and love. Rubbish. Complete and total garbage. Be distressed by your sin. Do not make peace with it, but continue to fight with it deep within you. For the rest of your life. Understand your condition and fight the good fight until in that twinkling of an eye, you are changed. Be encouraged by others who have fought the fight before you. And most of all, by the living Word of God that transforms us, changes us, and brings us peace, hope and life. Share your thoughts, struggles and encouragement below. I’d love to hear your thoughts. What Does It Take To Waste Your Life? What kind of life must you live for God to say at the great day of judgment…”you’ve wasted the precious life I’ve given you”? Better yet, how must you live for YOU to conclude that you’ve wasted your life? Sound like harsh questions? If so, then you should see what John Piper (and I conclude) thinks is the answer! I found this book several days ago and it’s hitting me like a ton of bricks right now cause I feel like John is saying what I’m not able to put into words as well as he did. I feel like this book is going to be yet another wake up call for me to realize that God is calling me (and you) to a higher standard, a deeper love, a more resolute passion and an unwavering commitment to His Glory. 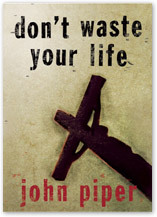 Do yourself a favor…Christian or not, go download the FREE copy of this book and read it from cover to cover. Don’t forget to subscribe on the right side of this page as we’ll be providing some AWESOME tools, tips, encouragement and resources to help you make sure that you Don’t Waste Your Life! Have you ever felt like we were missing it? It’s crazy if you think about it. The God of the universe – the Creator of nitrogen and pine needles…galaxies and E-minor – loves us with a radical, unconditional, self-sacrificing love. And what’s our typical response? We go to church, sing some songs and try not to cuss. Whether you’ve verbalized it yet or not…we all know something’s wrong. Why are there are over 350,000,000,000 BILLION galaxies…that we know of, most of which the human race has only seen in the last few years due to the Hubble telescope? Why does a caterpillar have 228 separate muscles in it’s head (that’s a lot for a bug don’t you think)? He didn’t have to put over 3,000 species of trees within 1 sq mile in the Amazon jungle or so many different kinds of laughter (you know…wheezes, snorts, quiet, loud, obnoxious), but he did. Did you know that spiders, when spinning their web can produce up to 60 ft of silk per hr while simultaneously producing a special oil on their feet so they don’t stick to their own web…that deserves some respect! When you get goose bumps, the hair in your follicles is actually helping you stay warmer by trapping heat. Or have you ever marveled at the fact that plants take in Carbon dioxide and produce oxygen? And those same plants started as a seed in the dirt, some watered some not, that transformed and defied gravity and poked their head/sprout out of the ground and into the sunlight. Does something deep inside your heart long to break free from the status quo? Are you hungry for an authentic faith that addresses the problems of our world in tangible, even radical solutions? God is calling you to a passionate love relationship with Himself. Because the answer to religious complacency isn’t working harder at a list of dos and don’ts – it’s falling in love with God. And once you encoutner His love as Francis describes it, you’ll never be the same. Because when you’re wildly in love with someone…it changes everything.